The law is clear – anyone seeking asylum must be allowed to make that claim – but many of those who are crossing don’t know that. Under federal law, anyone who reaches a U.S. port of entry may make a claim for asylum. But now it appears U.S. Customs and Border Protection is adopting a new tactic to keep out immigrants – telling border agents to stop would-be asylum seekers before they reach a border checkpoint. Veteran journalist Robert Moore, former editor of the El Paso Times, covers border issues for Texas Monthly. 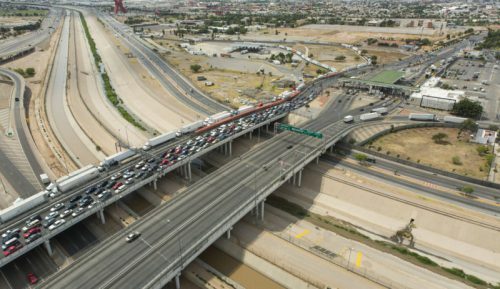 At a border crossing between El Paso and Ciudad Juárez, he observed the new approach. It’s unclear what consequences, if any, these individuals would face if they went ahead anyway. “The law requires that anyone seeking asylum, regardless of status, must be allowed to make that claim,” Moore says. He says the law is very clear on this issue – but many of those who are crossing don’t know that. That day he saw two representatives from Annunciation House, an El Paso organization that accompanies migrants across the border, defend asylum seekers. “Somebody who did know the law was there with a migrant to be able to make that case and tell CBP, ‘You have to take them in,’” Moore says. In California, a lawsuit is underway to challenge CBP officers who allegedly told migrants that the U.S. no longer takes in asylum seekers. “And then when you ask CBP, ‘Okay, how many people are you handling and what is capacity?’ you can’t get an answer,” he says. Moore says one thing that gets lost in the immigration debate is that seeking asylum at port of entry is a legal means of entry – and for many people, it’s their only option.